Compare Barbecues in New Zealand at Canstar Blue. Weber, Broil King, Gasmate, Jumbuck and Masport were compared on value for money, reliability, cooking performance, design, extra features, durability, ease of cleaning and overall satisfaction. * Overall satisfaction is an individual rating and not a combined total of all ratings. Brands with equal overall satisfaction ratings are listed in alphabetical order. Canstar Blue research finalised in December 2017, published in January 2018. Weber BBQs have all the right ingredients for a great summer sizzle. Weber’s sizzling hot when it comes to customer satisfaction. Nothing says ‘Summer’ like the smell and sound of meat sizzling on the barbecue and in New Zealand, we love them. In fact, 81% of us consider a BBQ an essential home appliance and 75% of us say it’s the main way we socialise with family and friends over the summer. 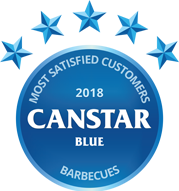 So, for the first time ever, Canstar Blue is delighted to award Weber five stars for Outstanding Customer Satisfaction. But if you’re in the market for a new BBQ, how do you choose which one is right for you? Gas, electric or traditional charcoal/wood burner? It’s only recently, in the last 20 to 30 years or so, that we’ve had a choice as to the type of BBQ we like to cook on. Traditionally, fuel was either charcoal, wood or pellets that would be left to burn white hot but the invention of the gas BBQ in 1954 and its subsequent evolution to the mainstream type we see today, opened up a whole new era in outdoor cooking. Powered via a refillable gas bottle, (usually LPG and refillable at your local gas station or hardware store) Gas BBQs only take a few minutes to heat up. Because you have options of using from one to all of the gas burners, heat can be more evenly distributed giving you a better chance of evenly cooked food. There’s also no messy ash to get rid of so cleaning up after is a lot easier too. Gas BBQs are by far the most popular type in the market today with 87% of Kiwis using them. Although dwindling in popularity – only 9% of the people we spoke to use one – the traditional BBQ evokes memories of burnt sausages, still pink in the middle, for many of us. This uneven cooking is unfortunately part and parcel of this type of BBQ as the fuel has to be lit and left to burn usually for around 40 minutes before it can be used for cooking. This can mean that the heat is not evenly distributed around the BBQ and food is sometimes hard to cook thoroughly. There’s also the dirty job of cleaning away all of the burnt ash when you’re finished (and after it has cooled down) but all of this is still a small price to pay if you’re after the authentic smoky flavour you inevitably get with this type of cooking. Electric BBQs are commonly referred to as ‘outdoor grills’ in New Zealand. Like the gas BBQ, the electric version is quicker to heat and easier to control than a traditional BBQ, but as you have no flame, the style of cooking is said to be significantly different – hence the ‘grill’ name. Again, there’s not much to cleaning but that’s not enough to convince Kiwis – only 3% of the people we surveyed used one. In 2017 the ACC (Accident Compensation Corporation) received claims for over 540 BBQ related accidents in New Zealand so although BBQs are often social, happy times, these simple steps can make sure things don’t go off with a bang! Position your BBQ at least three metres away from your house or fence and cut back or move any near-by plants or vegetation. This includes hanging baskets and (although it’s not a plant!) your garden umbrella or parasol. Always clean your BBQ thoroughly. If you light your BBQ and the heat catches a build-up of fat and grease, the flames can quickly get out of control. For gas BBQs, never turn it on with the lid closed. If it doesn’t light properly you’ll get a build up of gas and when you do open the lid and light it you could be creating a fireball. Never leave your BBQ unattended especially if you are cooking fatty meat (it’s always better to trim the fat to stop it melting and dripping on the open flame) and always have a water spray, and preferably a small domestic fire extinguisher nearby. Canstar Blue surveyed 2,500 New Zealand consumers across a range of categories to measure and track customer satisfaction, via ISO 26362 accredited research panels managed by Qualtrics. The outcomes reported are the results from customers who have purchased a new barbecue within the last three years – in this case, 688 New Zealanders.